The Onkyo TX-RZ820 puts you in the middle of the action. The Onkyo TX-RZ820 puts you in the middle of the action. This receiver's 130-watt-per-channel amplifier delivers clean, powerful sound at any volume. THX® Certified Select™ certification ensures spot-on, distortion-free reproduction of movie soundtracks. You'll enjoy stunning 4K picture quality with compatible Ultra HD TVs and Blu-ray players, too. Dolby Atmos and DTS:X provide multidimensional surround sound for a theater-like experience in your living room. Onkyo's premium RZ Series home theater receivers deliver music and movie soundtracks with detail and accuracy. The 'RZ820 is constructed with quality components like large custom capacitors for consistently great sound throughout the frequency range, and discrete non-phase shift amp circuits for a clearly focused audio image and reduced distortion even at high volume levels. A premium 32-bit/384kHz digital-to-analog converter gives you crystal-clear reproduction of music, TV, and movie soundtracks. Dynamic Audio Amplification delivers massive power with low distortion for thrilling movie sound effects. Phase-matching Bass Enhancement lets you enjoy deep, satisfying low-frequency effects while vocals and dialogue remain clear. This receiver also decodes high-resolution audio formats. And Onkyo's Music Optimizer improves the sound from compressed audio files and Bluetooth streams, so you get clear, detailed sound no matter how you listen. Built-in Wi-Fi lets you access the music you have stored on your networked computer so you can easily play tracks from your personal library through the 'RZ820. Chromecast built-in (requires a firmware update, available now) lets you use your computer, phone, or tablet to stream music from over 100 audio apps to the receiver. Use the Onkyo Controller app to control streaming from your mobile device. Apple® AirPlay® lets you stream from a compatible iOS® device or from any computer with iTunes®. And Bluetooth adds even more wireless music options. The 'RZ820 can power a total of seven speakers simultaneously with its seven amplifier channels. But it has outputs for 11 speakers, allowing for flexible speaker configurations. If you're happy with 5.2-channel surround sound in your living room, you can use the receiver's powered Zone 2 outputs to connect a pair of speakers for stereo sound in another room. Zone 2 A/B speaker outputs let you connect up to two additional pairs of speakers for stereo sound in different rooms. (The A and B speakers play the same source at the same volume.) You can also connect a stereo receiver or amplifier through line-level Zone 2 and Zone 3 connections and use the 'RZ820 as a preamp for those zones. That gives you full 7.2-channel surround sound in your home theater and stereo sound in up to two additional rooms. A Zone 2 HDMI output lets you watch video from two different sources in your living room and a second room. Use the Onkyo Controller app to control playback in different zones from anywhere in the house. Very pleased with the purchase. I upgraded from an older model Onkyo that didn't have video support, it was easy to setup and has excellent sound quality. I returned my last Onkyo because of network card malfunction, any problems with this newer model ? So far so good, no problems at all. Very good AV receiver. RZ Series: Onkyo's premium RZ series AV receivers feature upgraded components, such as a massive transformer and custom capacitors that provide high instantaneous current for lightning-fast transient response and a frequency range that extends down to 5 Hz. Discrete amp circuits prevent phase shifting, clearly focusing the audio image and cutting distortion even at extreme volume levels. The RZ series amplifier delivers a significant boost to the dynamics, detail, and accuracy of music and movie soundtracks for a listening experience that packs a stunning emotional impact. The RZ series is backed by a 3 year parts & labor warranty. 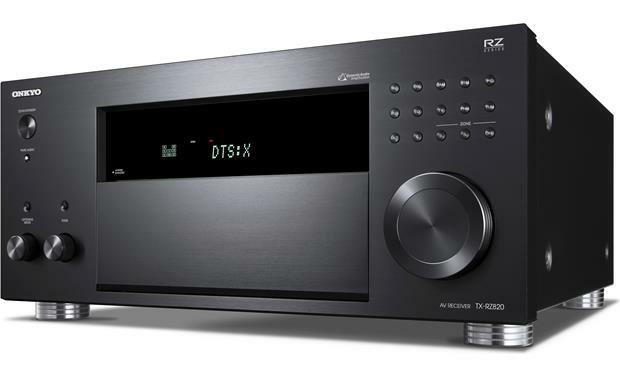 Dynamic Audio Amplification: The TX-RZ820 AV receiver features Onkyo's Dynamic Audio Amplification with a 7-channel amplifier rated at 130 watts (into 8-ohms, at 20Hz-20kHz, with 0.08%, driving 2 channels). Onkyo's new Dynamic Audio Amplification technology incorporates a Hi-Current, non-phase shift amplifier design with discrete output stage circuitry and a H.C.P.S (High Current Power Supply) capable of driving 4-16Ω speakers with dynamic control, while producing clear, detailed sound. Solid Aluminum Front-Panel: A solid aluminum front-panel aids in the receiver's anti-resonance performance. Surround Back (7.1ch): The Onkyo TX-RZ820 provides 7.1ch surround in your main listening area with dedicated Surround Back speakers. 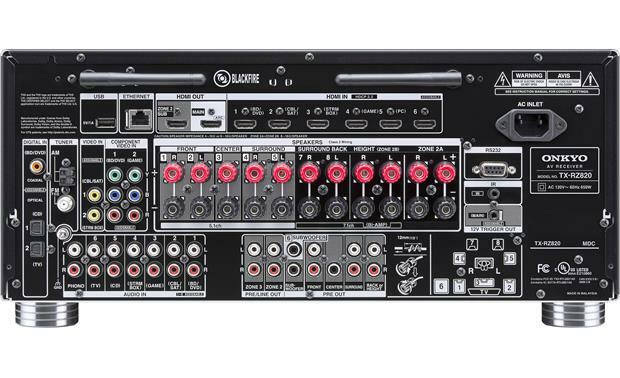 Powered Zone 2 (7.1ch + Zone 2): In this configuration, you can connect Front, Center, Surround, Surround Back, and Zone 2 speakers to the AV receiver. When Zone 2 is off, all seven channels will be used in the Main Zone. However, when Zone 2 is on, power to the two surround back (or front height) channels will be directed to the two speakers in Zone 2 and the Main Zone will receive only five channels of power. Dolby Atmos (5.1.2ch): The Surround-Back/Front-High speaker terminals are assigned to power a pair of Front-Height, Rear-Height, Overhead Ceiling, or Dolby Atmos-enabled speakers to create 5.1.2ch Dolby Atmos surround sound. Zone 2 speaker can still be powered by the receiver in the configuration. When Zone 2 is off, all seven channels will be used in the Main Zone for Dolby Atmos. However, when Zone 2 is on, power to the Dolby Atmos channels will be directed to the two speakers in Zone 2 and the Main Zone will receive only five channels of power without Dolby Atmos. 384kHz/32-Bit Hi-Grade DAC: The Onkyo TX-RZ820 utilizes one premium-quality AK4458 digital-to-analog converter from Asahi Kasei for all channels. This 384kHz/32-bit DAC implements unique low-distortion filtering technologies for clear sound, and unlocks the full potential of any audio format, including compressed, lossless, and hi-res audio (MP3, WMA, WMA Lossless, FLAC, WAV, OggVorbis, AAC, Apple Lossless, DSD 5.6 MHz, LPCM, and Dolby TrueHD). Vector Linear Shaping Circuitry (on All Channels): Onkyo developed Vector Linear Shaping Circuitry (VLSC) to reassemble the signal in its original form-following processing. Unlike conventional filters, VLSC removes pulse noise generated in D/A conversion, allowing the sound wave to be reproduced with extremely high fidelity for a smooth analog signal. The signal's data is converted between sampling points and joined with analog vectors in real time to produce a smooth output wave form. The result is a virtually noiseless, smooth, analog signal that brings out even the most subtle of nuances in music sources. PLL Jitter-Cleaning Circuit Technology: PLL (Phase Locked Loop) jitter-cleaning circuit technology reduces jitter by comparing the input and output phases of the digital signal and creating an accurate clock waveform. This enhances the precision of digital signal processing and noticeably improves audio quality. Jitter-cleaning technology works both for digital signals input via HDMI and for digital signals converted from analog signals inside the receiver itself. Dual 32-Bit DSP Engines: The Onkyo TX-RZ820 AV receiver employs powerful and highly accurate 32-bit DSP (Digital Signal Processor) engines for better surround sound reproduction. Immersive Surround Sound: The Onkyo TX-RZ820 AV receiver goes beyond regular surround with the latest immersive surround sound formats, including Dolby Atmos, Dolby Surround, DTS:X, & DTS Neural:X.
Dolby Atmos: With Dolby Atmos, sound comes alive from all directions, including overhead, to fill your home theater with astonishing clarity, power, detail, and depth. The TX-RZ820 has the processing power to run a more enveloping 5.1.2ch Dolby Atmos layout utilizing ceiling mounted or Dolby Atmos-enabled speakers (sold separately). A 5.1.2ch speaker configuration is based upon a traditional 5.1 speaker layout complemented by 2 overhead or Dolby Atmos-enabled speakers. THX Certified Select: THX Certified Select guarantees the same high-volume sound you experience at a commercial theater in your home. To gain certification, amplifiers must pass the industry's most severe bench-tests covering every aspect of audio performance to satisfy THX requirements. THX Certified Select is suitable for medium sized rooms, up to 2,000 cubic feet in size, with a 10-12 foot viewing distance from the screen. THX delivers superior sound quality for movie, music, and gaming soundtracks. Power Output: Power output is tested to ensure the receiver accurately plays source material at THX Reference Level in every input and mode and at every sampling rate for all possible playback combinations selected by the listener. management. This setting confirms that the subwoofer handles low frequencies, freeing up the loudspeakers to handle mids and highs. performance with very little to no audible hiss from the speakers. RE-EQ: Many movie soundtracks are mixed in studios for playback in large cinema auditoriums with an array of speakers. When played on home systems, they may appear abrasive and edgy. Re-EQ establishes a more accurate tonal balance when enjoying movies in your home. Timbre Matching: Your ears hear different tonal qualities in sounds coming from different directions. Timbre Matching restores the frequency balance between your front and surround speakers ensuring seamless and smooth panning between the front to back of the room. Boundary Gain Compensation (BGC): Sitting near a wall may result in distorted bass response. BGC corrects the way low frequency sound is perceived when seated near a wall. This results in a more accurate bass response. level relationship as you turn the volume down. With THX Loudness Plus home theater audiences can now experience surround sound at any volume level. THX Cinema: Recreates the ambiance of the movie theater by positioning the 5.1, 7.1and immersive mixes to submerse you in the movie's soundtrack. THX Game: Distributes the sound effects and dialogue generated by the game engine by placing the audio from a 5.1, 7.1 or immersive mix to the appropriate "action" location - creating 360-degree gaming experience. THX Music: Emulates the original studio environment for the 5.1, 7.1 or immersive mix for an accurate and increased sense of spaciousness and localization - placing you directly in the recording session. THX Surround EX: Decodes the third surround channel from the traditional two surround channels to create a more immersive entertainment experience. Note: THX Select is previously known as Select2. 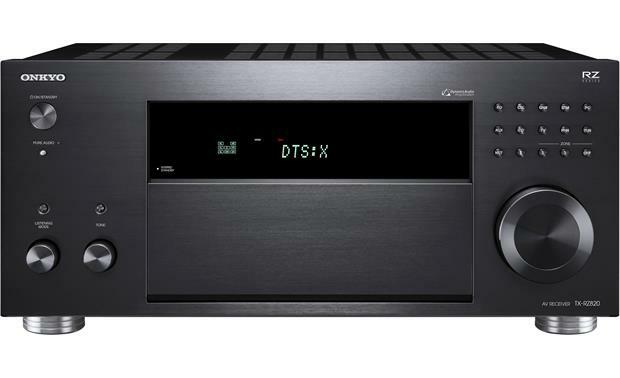 Audiophile Listening Modes: The Onkyo TX-RZ820 offers two audiophile listening modes which bypass the receiver's tone & DSP processing for higher sound quality performance. In Direct mode, audio from the input source is output without surround-sound processing. This mode delivers pure sound with minimum sound quality adjustment and filtration. In Pure Audio mode, the display and video circuitry are turned off, minimizing possible noise sources for the ultimate in high-fidelity audio reproduction. AccuEQ w/ AccuReflex: AccuEQ conducts two measurements: (1) it measures and sets the distance, sound pressure level and crossover of your speakers and subwoofer to ensure all channels are treated equally (2) it evaluates your room's sonic characteristics and adjusts your speaker's frequency response to prevent standing waves from forming. AccuEQ incorporates AccuReflex technology to align the phase of upfiring "height" speakers with the sound coming directly from your other speakers. Any delay is resolved so that everything arrives at your ears at the same time. The result is cohesive reproduction of object-based soundtracks. You can save up to 3 AccuEQ presets. The included microphone plugs into the front-panel of the receiver. Audio Enhancements: The Onkyo TX-RZ820 receiver provides various audio enhancements to deliver a high-quality listening experience every time. Bass Management: The Onkyo AV receiver offers Tone Control, Phase Matching Bass technology, and a Double Bass feature to get the most bass impact out of your system. Phase Matching Bass: Onkyo's Phase-Matching Bass optimizes low frequencies while preserving mid-range clarity. This means that powerful bass plays back with clear vocals; it doesn't overpower them. Double Bass: You can also activate the Double Bass function in order to boost bass output even more by feeding bass sounds to the front left/right speakers, center-channel, and powered subwoofer. Volume Setup: The Onkyo AV receiver provides the following volume settings. Maximum Volume: Use this feature to set the receiver's maximum volume level. This feature is useful to avoid turning the volume too loud by mistake. You can set the Max Volume from 30-79 (max), or Off (disabled). Power On Volume: Use this feature to set the volume level when the power is turned on. You can choose between Last (same as the volume when the unit was turned off), Min (0), or 1-79. Analog Audio Outputs: The Onkyo TX-RZ820 is outfitted with the following analog audio outputs. 7.2ch Pre-Outs: The Onkyo TX-RZ820 features 7.2ch pre-outs (Front, Center, Surround, Surround Back/Height, and Dual Subwoofer) for connection of an external power amplifier. The pre-outs are variable. The dual sub outputs are wired in parallel and share the same input signal (they are not discrete). Phono Input: The Onkyo AV receiver is fitted with a Phono (MM) input and ground terminal for connection of a turntable, so you can enjoy listening to your vinyl records. HDMI 2.0a: The Onkyo TX-RZ820 has seven HDMI 2.0a inputs (6 rear/1 front) and dual HDMI 2.0a outputs. Thanks to the latest HDMI 2.0a specification, the receiver can support 4K/60 Hz Ultra-HD video, HDCP 2.2 compatibility, 4:4:4 color sub-sampling, High Dynamic Range (HDR), and BT.2020 Wide Color Gamut. 4K/60Hz: The TX-RZ820 supports up to 4K (3840x2160 pixels) video @ 60 frames per second on all of its HDMI inputs and outputs. It will also pass a 480p, 820p, 1080i, or 1080p video signals via HDMI (not compatible with 480i video signals). HDCP 2.2: The receivers HDMI inputs and HDMI outputs support HDCP 2.2, which fully complies with the latest copyright protection standard for 4K video transmission. 4:4:4 Color Subsampling: The receiver's HDMI inputs and HDMI monitor output support RGB, YCbCr 4:4:4, YCbCr 4:2:2, and YCbCr 4:2:0 color subsampling (@ 60Hz or 50Hz). With 4:4:4 color subsampling, luminance (brightness) and chroma (color) are sampled at the same rate; resulting in an RGB color palette as big as the video sampling rate for a video image with more colors, plus greater color accuracy and detail. HDMI inputs 4-8 only support 4K 60/50Hz @ YCbCr 4:2:0. Dual HDMI Outputs: The dual HDMI outputs can simultaneously output the same audio/video signal to two TVs, or you can assign the second HDMI output to Zone 2 to display a different HDMI source (1-3 input) in another room (video is output at the resolution supported by both TVs). Other HDMI Features: The TX-RZ820 AV receiver's HDMI connectivity also offers 3D video pass-through, ARC (Audio Return Channel), Deep Color & x.v. Color support, as well as an auto LipSync function. Wired or Wireless Network Connection: The Onkyo TX-RZ820 AV receiver supports a wired Ethernet (RJ-45) or wireless WiFi (802.11 a/b/g/n; 2.4/5GHz) network connection. Via the AV receiver's network connection, you can enjoy music files stored on your computer and listen to internet radio through a variety of online music services. Built-in Online Music Services: The Onkyo TX-RZ820 offers several built-in internet radio & online music services through its wired or wireless network connection. Chromecast Built-In (Firmware Update Available): Chromecast built-in lets you instantly stream a variety of music apps from your Apple (iOS 7.0+) or Android (OS 2.3+) mobile device to the Onkyo stereo receiver. Chromecast built-in works over WiFi and allows you to connect more than one device at a time to the receiver, as well as control what's playing from anywhere in the house with your compatible mobile device. Note: Make sure the TX-RZ820 has the latest firmware/software update installed. To use Chromecast built-in, you must agree to Google's Privacy Statement. Built-in Bluetooth: The Onkyo TX-RZ820 features built-in Bluetooth (version 4.1+LE) with support for profiles A2DP 1.2 and AVRCP 1.3. You'll be able to wirelessly stream stored music and music apps from your Bluetooth-enabled Apple iPod/iPhone/iPad, Android smartphone/tablet, Windows Phone/PC, & Mac laptop/computer, as well as other Bluetooth compatible devices to the Onkyo receiver. SBC + AAC Codecs: In addition to support for the standard SBC Bluetooth audio codec, the TX-RZ820 offers support of AAC. By supporting AAC, the receiver offers better audio performance of the music streamed from your Apple iPod, iPhone, or iPad. HDMI Zone 2: The Onkyo TX-RZ820 AV receiver provides a Zone 2 HDMI output, so two different HDMI audio/video feeds can be sent to two different displays at the same time directly from the receiver (HDMI 1-3 connected input sources only). HDMI Zone 2 will output up to 4K video and 2-channel audio for the HDMI input source selected. Video will be output at the highest resolution supported by both TVs. If you have the same HDMI source playing back in the main room and Zone 2, then the main room is also limited to 2ch PCM audio. Compatible Sources: HDMI 1-3 connected input sources only (up to 4K/2ch PCM). Incompatible Sources: Tuner, Analog, USB, Bluetooth, Network, and Optical/Coaxial Digital audio sources; plus analog video sources and HDMI 4-7 inputs. Zone 2 (Audio Only): In addition to the main listening room, you can also enjoy audio playback from a different source in another room of your home using the receiver's Zone 2 function. The receiver features Zone 2 line-outputs, as well as Zone 2 (A/B) speaker outputs. You can play the same audio source in both Zones (Main & Zone 2) or play a different audio source in each zone. Zone 2 is compatible with analog, digital, and wireless audio sources - see below for details. Line-Level Outputs: By using the line-level outputs on the TX-RZ820 you can connect an external receiver or integrated amplifier in a second room, allowing you to listen to 7.1ch surround in the main room and play a different audio source in another room of your home. The volume of Zone 2 will be controlled from the TX-RZ820 or your add-on integrated amplifier/receiver. A/B Speaker Level Outputs: The receiver features Zone 2 speaker A/B outputs. By using theses speaker-level outputs on the TX-RZ820, you can directly connect up to two pair of speakers in another room of your home, allowing you to listen to 5.1ch surround sound in your main room and play a different audio source in the other room. It is able to do this by reassigning the receiver's Surround Back amplifier channels to power the Zone 2 A/B speakers. Zone 2A & Zone 2B will play the same audio source at the same volume level. When connecting both Zone 2A and Zone 2B speaker, your speakers should have a minimum of an 8Ω to 16Ω impedance. The volume of Zone 2 is controlled from the receiver. Compatible Sources: AM/FM tuner, HDMI Audio 1-3 (2ch PCM only), Analog & Optical/Coax Digital (2ch PCM only) inputs, USB & Bluetooth Audio, Network (including DLNA, AirPlay, and built-in music apps) can be played back in Zone 2. Incompatible Sources: HDMI Audio (4-7), as well as HDMI video and analog video inputs cannot be output to Zone 2. Chromecast built-in apps and DSD audio files cannot be played back in Zone 2. When listening to AM/FM radio, you cannot select different stations for the main room and Zone 2. Zone 3 (Audio Only) Line-Level Outputs: Zone 3 allows playback of a separate source in 2-channel stereo in a third room of your home. Zone 3 features line-level outputs only. This way, Zone 3 can be powered by a separate integrated amplifier (keeping either 5.2ch or 7.2ch playback in your main room). The volume of Zone 3 can be controlled from the TX-RZ820 receiver or your add-on integrated amp. Compatible Sources: AM/FM tuner, Analog inputs, USB & Bluetooth Audio, Network (including DLNA, AirPlay, and built-in music apps) can be played back in Zone 3. Incompatible Sources: Optical/coaxial digital audio sources, HDMI sources, and any video source cannot be played back in Zone 3. Chromecast built-in apps and DSD audio files cannot be played back in Zone 3. When listening to AM/FM radio, you cannot select different stations for the main room and Zone 3. FireConnect MultiRoom Audio (Firmware Update Available): FireConnect powered by Blackfire mirrors network audio sources and any external analog source playing through the receiver (from streaming audio to vinyl) on optional FireConnect/Blackfire wireless speakers (such as the Onkyo NCP-302, sold separately). Sampling rates up to 48 kHz are supported. FireConnect powered by Blackfire is stable, fast, and easy to control with Onkyo's Controller app for Apple iOS and Android. Note: Make sure the Onkyo receiver has the latest firmware/software update installed. Onkyo cannot guarantee the compatibility with other devices featuring FireConnect or Blackfire. Onkyo Controller App: The Onkyo Controller app (for Apple iOS 8.0+ & Android OS 4.0.3) features an intuitive, user-friendly interface that allows you to conveniently operate the Onkyo receiver from your compatible Apple iOS or Android device. This app not only has the usual remote control functions, it also has a multiroom functionality for Zone 2 and Zone 3. Multiroom Audio: Provides control over Zone 2 and Zone 3 for wireless multiroom audio (such as FireConnect by Blackfire). Google Home Voice Commands: With the Google Home voice-activated speaker (8064658762, sold separately) and the Google Home App (for Apple iOS 8.0+ or Android OS 4.2+), you can use your voice to control select functions of the Onkyo AV receiver. With a simple voice command, you can play music from Chromecast compatible music services by artist, song, genre, album, playlist, mood or activity. You can also turn up the volume, skip to the next track, or stop the music - all without lifting a finger. HDMI Control: This function allows HDMI-CEC compatible components or RIHD-compatible components connected via HDMI to be controlled with the TX-RZ820. The AV receiver offers the following HDMI-CEC controls. Control & Custom Integration: The TX-RZ820 includes system integration connectivity such as RS232 with support for 2-way communication with 3rd party home automation systems. An infrared (IR) input allows pass-through of IR signals to control other devices connected to the TX-RZ820, such as a TV or Blu-ray player. The 12 volt trigger can be used to raise/lower a projection screen, power on/off an external amplifier or open/close the drapes with the touch of a button. What's the signal to noise ratio on the txrz820? Not a clue. I'm sure Onkyo would be able to answer. What's the frequency response on txrz820? Sorry I can't tell you as I've been so busy I haven't had time to play with it other than to simply turn it on, low volume, and use it quick and easy. Mine does sound good hooked up to 8 speakers and 2 subs, all by Klipsch. Is the height channel rear or front? I am interested in buying this receiver (Onkyo RZ820), but I am concerned about some of the reviews that indicate a HDMI issue. Has this been resolved, is it a persistent problem or not a problem, is it a user issue or equipment, etc.? Would like to know the risk if I purchase this unit. So I have owned the TX-RZ820 for about a year. No issue for me with HDMI or any other input/output. The receiver has exceed my expectations. The sound is mind blowing. My tv is a Samsung OLED and video quality is exceptional using the TX-RZ820. I did do a firmware update about six months ago. I replaced an Onkyo TX-NR 818 due to hdmi issues, with this model. Had it for a year now and have had no problems. I run all of my TV and of coarse, movies through it. Love the sound. This has been my experience and personally would buy it again. I have no HDMI issues whatsoever. I have my cable box and blu Ray player connected to it. The pass through function works well. It has a lot of functionality so make sure you read the manual thoroughly. I feel some may not do that and assume it is an issue with the unit when it is actually performing as designed. Can you cast video from Hulu or YouTube to the Chromecast built-in, or only audio? You can cast video as well as audio. Is there any way to connect one of the old-style iPods (no Bluetooth) to this receiver? Of course. You can connect one of those to anything with an analog audio input such as this receiver with a headphone to RCA cable. You can connect to the RCA imputs. Is there a trigger for turning on and off an external power amp for the left and right speakers in a zone 1, 7.1 set up? Currently have the 838 model that the trigger is only for zone 2. The TX-RZ820 does feature a 12volt trigger output you can use to turn on an external amplifier for the main zone, yes. I have two sets of speakers in my main listening room. I have a KEF 5.1 surround set for movies and I have a separate dedicated pair of Klipsch towers for listening to music. The receiver I plan to replace (Pioneer VSX92THX) has a speaker A/B switch that I am able to use to keep those two sets of speakers available for use. How would I be able to do that on the Onkyo TX-RZ820? I noticed it does not have A/B functionality. Would I need to set up the stereo pair on Zone 2? Do I lose and fidelity or power by doing that? I have my Onkyo TX-RZ820 setup for 5.1 home theater in the family room and then I have 2 speakers mounted in my patio area. I use zone-2 for the speakers I have mounted in the patio area. That setup allows me to use my home theater setup normally and listen to music via the Tuner while I'm out on the patio bbq'ing. I simply select the Zone-2 button on the front panel and then select the Tuner button. Hopefully this helps. So I'll have two front speakers, two Atmos front add on speakers, my center speaker, subwoofer, and two rear height effects Atmos speakers. Will this receiver be a good choice for this setup? Thank you in advance. As long as each one of your speakers don't exceed 130 watts per channel into 8 ohms (20-20,000 Hz) at .08% THD, with 2 channels driven. can this unit be used on a 240v voltage as is or does it need a step down transformer to 110v? Mine is rated for 110 V and 60 Hz only. The specs indicate there is a 220 V 50/60 Hz model. The manual says North American models are 110v, it says other for 220v. Hope that helps. Can this unit be run on a 240V supply as it is, or will I need a step down transformer to 110V? I'm not sure. I only used 110V which works fine. Can hdmi audio output to zone 2 speakers? For example, if I am watching football in zone 1 with a 7.1 speaker setup, can I send that audio to zone 2? I am assuming that zone 1 would drop to 5.1 and zone 2 would be straight 2 channel. Basically I'm looking for hdmi audio output for zone 2 speakers, not TV speakers. Has anybody else had trouble using long HDMI cables? If I can't use a long HDMI cable I will be returning it. Otherwise this unit is Awesome. What do u mean by long. I have a 15' cable and have had no issues. Rcvr is awesome. I'm using 25 ft. And have no issues. My HDMI cable is 25 feet, works fine. What is the difference between tx NR777 and the tx RZ820 besides the watts?? When broadcasting from 2 sources to 2 zones, can I have the volume at different levels in each room? For instance, I might want be playing a video game softly in the family room and playing music in the back yard at higher volume. Sorry. Don't know. Have not had a chance to setup. Does zone 2 HDMI have audio pass through? I had had a previous Onkyo for 10 years, loved it. I bought Onkyo TX-RZ820, had problems with video upscaling (it doesn't do) and I returned it. I feel bad because the first sales person did not know and mistakenly told me that it did upscaling to 4k. I've no problems at all with this unit. It functions exactly as advertised. I have had my 820 for a few months now with NO issues of any kind. Love it as the sound is as good as any unit out there. Networking has been easy. New units have added two more speakers. That is the only difference I have seen. So far no problems with my TX-RZ820. Wireless connection is good & stable. No wired connection used. Why did Onkyo do away with the switched a.c. outputs on the unit? Don't know. I miss it also, used it for turntable not TV. Does this receiver send audio through the sub HDMI out? In other words, does a TV connected to the 2nd HDMI out receive audio in addition to video? Also, can zone 2 (sub) hdmi be set to one input and zone 2 speakers be set to another? For example, could the zone 2 display show cable TV via HDMI and the zone 2 speakers play music via AirPlay, etc? Yes & No. The Zone 2 HDMI output provides audio (2 channel) to the second display/TV. When using the Zone 2 HDMI output, the Zone 2 audio (pre-amp and powered) would be the same as the Zone 2 HDMI. There is an audio-only Zone 3 output (requires the addition of an external amp to power the speakers) which can be set to a different source than Zone 1 or 2. You will find this information, and more, by clicking the "Details" tab on the receiver's main webpage and scrolling down below the "Features & Specs" table. Can this receiver process 9 channels with an external 2 channel amp? I believe via bi-amping or using the 7.1 pre-out's you can obtain that many channels (such as for Atmos). As I understand it in fact doing Atmos with optimal setup recommends another amp. If it helps, I have been running the unit for 3 months now with no HDMI issues whatsoever. I've only been using my unit for 3 months, but no problems as of now. Caveat; It is my first Onkyo with HDMI inputs. My previous Onkyo TX DS989 was an outstanding unit. I too was concerned about the HDMI issues that I have read about before purchasing. I have had no such issues. The unit performs flawlessly and the HDMI pas through function works as it should. My only gripe about this unit is very minor. I have not found a way to turn off the front speakers when for example, when using this unit as a pre-amplifier and using the provided pre- amp outputs. I have had this receiver for a few months now with no hdmi issues. I replaced a model 818 because of hdmi problems that started about 6 months into ownership. This model seams to be more stable and has great sound. Waht is the difference between this receiver and the RZ810? They apear to be both the same except, I see additional information on the RZ820 for HDR. Wondering what the additional cost gets you? Searches related to the Onkyo TX-RZ820 7.2-channel home theater receiver with Wi-Fi®, Bluetooth®, Dolby Atmos®, and DTS:X™.